At The Races is a horse racing media rights company which operates the Sky Sports Racing TV channel and the website attheraces.com. Domestic distribution of the TV channel extends to over 14 million UK and Irish homes via digital satellite and cable television on the following channels: Sky 415, Virgin 535 and Virgin Ireland 418. The company is majority owned by BSkyB and operates through a joint venture partnership between BSkyB and Arena Racing Company (ARC). What is ATR Player? The ATR Player allows users to watch Sky Sports Racing live racing as well as your favourite Sky Sports Racing programmes. How much is the ATR Player subscription? The cost is £9.99 per month or €12.99 per month. Which devices can I view ATR Player on? You can access the live racing on your desktop, mobile and tablet devices. How long does the ATR Player subscription last? The subscription is a rolling one month contract and will renew automatically until you decide to cancel it. How do I cancel my ATR Player Subscription? Please email info@attheraces.com and include your reference number or date of birth and we can cancel that for you. As we’re not 24 hours, if you request a cancellation and your subscription renews, we can refund you. Can I view the ATR Player outside of the UK and Ireland? The service is only available in the UK and Ireland. Is my ATR package on Sky/Virgin the same as ATR Player? No, these are two separate subscriptions. ATR Player is an online subscription that enables you to view the live racing online. The Sky Sports Racing channel is available through a package with Sky Digital or Virgin Media. My live feed is buffering/freezing how can I stop this? Please check that this is not an isolated incident. Are you having problems with other video content? This may be due to your Internet Service Provider or home network. If you are experiencing issues on either a PC or Mac please try to access attheraces.com using Google Chrome or Mozilla Firefox, both of which are free to download. Please make sure your software is up to date. If you are still experiencing difficulties, please email info@attheraces.com and we will look into the matter further. Why can't I access the replays? Please make sure all your software is up to date and you are using either Chrome or Firefox. If you are still having issues, please contact info@attheraces.com. Why do I get a blue popup appearing at the bottom of my screen? Why does the website change to mobile/tablet/desktop version? We have updated our site to improve the user experience across all platforms from smartphones to desktop PCs. We detect the device you are using and try to direct you to the best site for your device. You can change the version of the site you are viewing by clicking or tapping on the Switch Site tab at the bottom of every page on all three sites. Once you have selected a device specific site you shouldn’t see the popup again. Is there an ATR App for iPad? Our bespoke iPad version of the app offers extra content and functionality including extra form information, a more detailed results section plus the option to download racecards and form for offline use. I’m having issues watching the live racing on my app If you are experiencing issues, please delete app and download the app again. If you’re having issues downloading the app on your android phone. Please download the app ‘file manager’ from Google play and open the ATR app file using that. How do I register? Please go to www.attheraces.com , click on the top right hand side icon that says login/register. I can’t log into my account/ How do I reset my password Please make sure you are entering the correct password with no spaces and the cap lock isn’t on. If you are still having issues, please email info@attheraces.com include your date of birth for security purposes and we can send you a password reset link. How do I update my email address? Please email info@attheraces.com please include your old and new email address as well as your date of birth for security purposes and we can then update your email for you. How do I update my payment details? Please email info@attheraces.com please include your reference number or date of birth and we can cancel your subscription in order for you subscribe again with your new details. 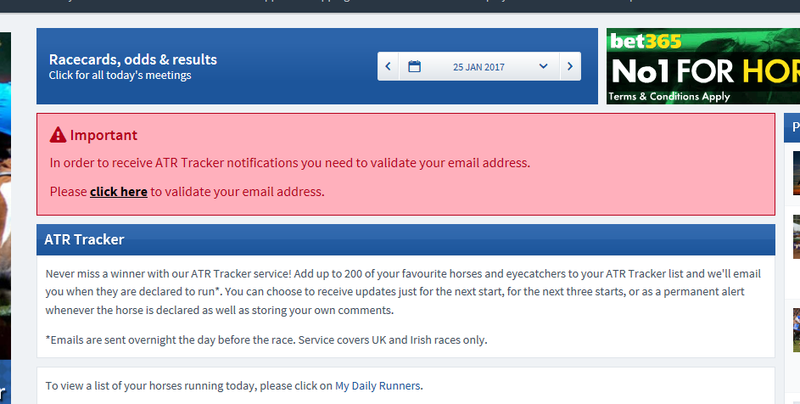 Why aren’t I receiving my ATR tracker emails? To receive your tracker emails, please make sure you have validated your email address. To do this, please log into your account and go to your tracker where you’ll see this message. Make sure your alerts are set to permanent to always receive your tracker emails. This functionality isn’t available on the app, so please set them through the desktop version. I’ve received a payment issue email, what do I do now? Please email info@attheraces.com, please include your reference number or date of birth and we can investigate further for you. Which packages is Sky Sports Racing available on? Virgin Media (535) – SSR is available on the TV M+ package. To order, call 0845 840 777. Sky Digital (415) - SSR is available on the Variety package 0333 009 2816 Virgin Media Ireland (418) SSR is available on the Virgin Full House TV package – to order, call 1890 940 070. What is the email address for the studio? studio@attheraces.com. I would like to access race footage from you, who do I need to contact? Please email info@attheraces.com please include as much information as possible, race details, date and time and horse name. Also, please include the format you would like to host/broadcast the race.